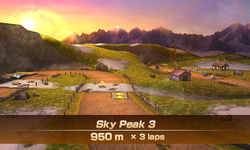 Sky Peak 3 is the final course of the Sky Peak area and the final track of the Champion's Cup in Mario Sports Superstars. It is unlocked, with the rest of the Sky Peak tracks, when players clear the Star Cup of the horse racing sport. As with all final tracks of each respective series, the track takes place at a different time of the day than the other Sky Peak tracks, this time taking place at sunset. The track has a length of 950m, tying with Sky Peak 1 for having the second-longest overall horse racing track. The track mostly takes elements from Sky Peak 1, featuring the same small stepping stones that players must jump over to traverse snow that slows racers down, as well as having rock ramps on the track; the track also has pockets of snow that slow racers down in the same manner as off-road portions. Players start out straight until they turn at a curve to the right, which they can jump over hedges to retrieve carrots. Players then need to traverse through two tight hairpin curves, adorned with hedges with items on top of them. 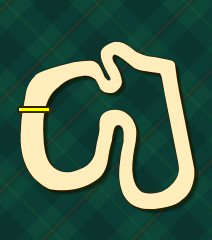 Past the second hairpin curve, players need to jump over many hedges, most which contain carrots on top of them. On the outer edge of this area, players can traverse past a rock and go on a dash panel while collecting stars. The path is then split by a rock in the middle, which this road is additionally covered with pockets of snow that slow players down. After players go on a dash panel, they take a long, gentle curve to the right, decorated with many windmills in the background, which is covered with many long hedges that players should jump over. Taking the inner route allows players to collect many carrots, while the other path has fewer items in the form of stars. Players then travel in a straight portion of the track, where they need to jump on stepping stones over snow that slows them down; players can take a dash panel to the right that allows them to speed through the snow without slowing down. Players then travel through a tight hairpin curve, and encountering another set of stepping stones over snow and a rock ramp to the right that allows them to bypass the stones with less items. Players can then use a dash panel to travel through the track through the pockets of snow, where the last curve of the track presents them with another ramp on the outer edges that leads to a cluster of stars and many pockets of snow that players slow down from if they do not jump over. The last area of the track has a dash panel past the aforementioned rock ramp on the outer edge that leads players to the finish line. The first portion of the track. Past the two hairpin curves, with hedges with items on top ahead. Just before the large curve, with long hedges and many items to collect. The last part of the track. This page was last edited on September 10, 2018, at 22:22.